I've been betting on the English Premier League since it started, since it's inception i've been refining a system which allows me to predict results. Last year I took this public and posted a security over at the now defunct Coinsortium platform. I'm back again for the new Season starting on Aug 8th 2015, but this time utilising the NXT platform. 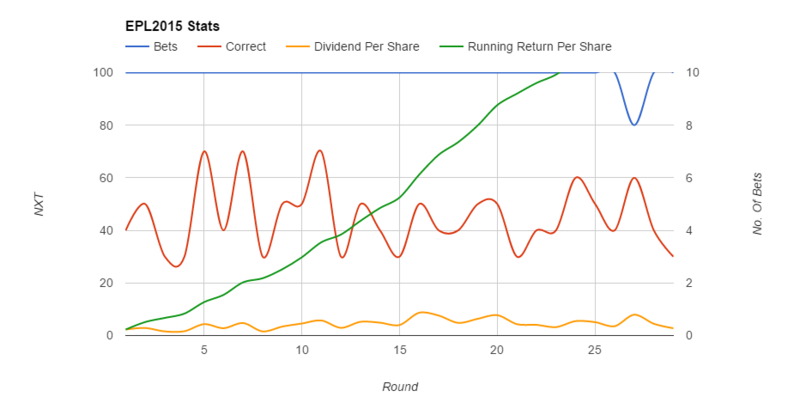 Last year we achieved a 135% ROI by predicting 53% of all game outcomes correctly. Just under 24 BTC was paid out over the season in dividends. 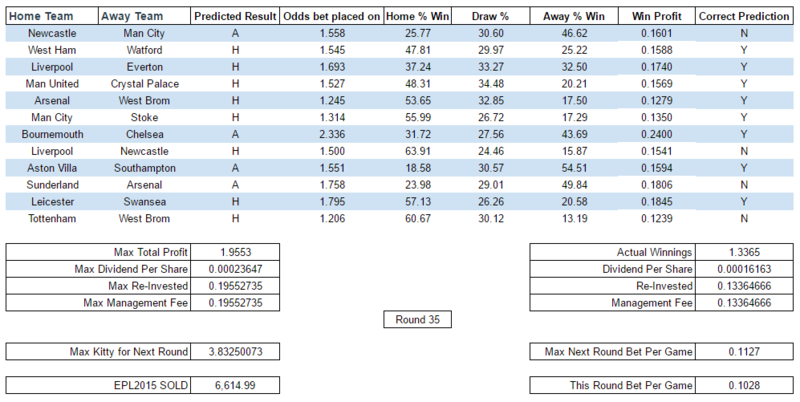 I utilise statistics from various sources, combined with my own specific calculation, which gives me a Home-Draw-Away percentage, which i then place bets on the most likely result. These percentages are provided via email to those holding the tokens, and results are sent too. I have a facebook group that you can be added too if that is more your thing. If required i can publish results here too if needed. This tipping service alone would cost your more than a token! It's more of a fun project than for making big dollars, something to add a little spice to watching the games each week. Have you created the Asset on the Asset Exchange yet? If so, what's its Asset-ID number? I'm not sure i see the value in it? I'll take it under advice from a few of my peers though. It look slike only 10 Assets have ever been reviewed by them? Is there something specific you'd like to know or have disclosed? I don't have a full set of results for the CS, and not being a EPL game and the first game of the season it won't be as accurate as my EPL predictions. Have just put out an open order. Thanks for putting it back up. I just ponied up the Nxt for 200 units. Was a former holder before that awful site went down. Will definitely invest. Something to clear up though. I think a lot of people misinterpreted this on Coinsortium. The 135% ROI is if you bought at the start of the season and calculated all the dividends you received as the year went on correct? There was a lot of trading of this asset throughout the season as people saw a reliable paying asset. If the asset was supposed to track it actual value, the price should have regularly gone down, instead it stayed reasonably the same/went up. This is obviously not the issuers fault since he was/is pretty clear about it, but I just thought it was worth mentioning. Each time you buy later in the season you return will be less. @TIPSEPL if this is successful, would you be issuing a new asset for each season of the year? If I am reading this correctly the asset issuance constitutes the bank roll used for the season right? Correct, 135% if you purchased shares before the start of the season. You still made ROI if you brought before half way through the season (or later if you sold your tokens), but the ROI was less. This could be different this season, depending on results of the system. Also just to mention I have now sold over 10BTC worth of tokens and as such management fees will apply from Round 1. Thanks for the clarification. Great project! I have been buying TIPSEPL's English Premier League betting system shares ever since he was on Coinsortium (they went under). He has provided awesome returns and is extremely transparent with what is going on because he publishes his bets and results (before & after). I highly recommend purchasing shares and TIPSEPL is one of the few asset owners I completely trust. Keep it up TIPSEPL and thank you. Round 1 Tips have now been placed. The Norwich v Palace game is a super close call, should be a very close matched game. The tyneside derby is always a good game to watch, the fans up there are crazy loyal, again another close game predicted. The match of the round for me is the Stoke - Liverpool game. Will stoke repeat the 6-1 drubbing from last season? Bookies are saying it should be a Liverlol win, but all the stats are pointing otherwise. For the newcomers, Dividends are paid once all matches are completed, usually next day. Thanks! I'm glad I bought my 200 shares. Man City vs Chelsea is the game of the round. City are favorites to win, and the system has them clear favorites too. Chelsea coming off a draw with Swansea last week and city with a nice 3 goal win against West Brom. Round two now complete and dividends paid. Slowly building momentum. 1 better result than last week. Start of the season is always a bit random as squads get to know each other etc. Is this legal in the running kind . I think in Germany falls under the organized illegal gambling with possible imprisonment . Can someone enlighten me? ...just do not want that here people regret something just because they wanted to win $ 100...I would also like to create a sports bet asset for clubnxt , but I'm not allowed under German law...I may not offer or play. As expected the odds are slightly better with the results we've had so far this season. A few really good games, Arsenal vs Liverpool is a big clash, Everton vs City is always a good game and the Stoke vs Norwich game should be very close battle too. I guess each country will be different, and their stance on digital currency may play in to it? This isn't a massive gambling pot, just a away to add a bit of fun to games, it's a hobby not a business. Round three now complete and dividends paid. A heap of unexpected draws this week let us down. Looking back last year we had a similar pattern to start us off, turn around was about week 5, lets home we see this next week! Round 4 Tips have now been placed. The stats have most of the games quite one sided this week, but as we've seen there have been some odd results already this season. Round four now complete and dividends paid. Another strange strange week. Liverpool, Chelsea and Utd all losing to teams they really should have beaten. The avg success rate still sits at 37.5% and we are still early in the season. The bigger teams should kick in to gear, or the system will start to factor in their recent form over the next few weeks. Typically we have seen better results from round 5 and beyond. Are you using core dividends payment? I didn't receive any dividends. Yes using the dividends payment in the wallet? There is issue, that core dividends payment is not visible without using special plugin, still. Thank you, checked, everything looks OK.
Any news about new dividends? There was a break in European club football for the European qualifiers. This weekend the Premier League will resume. Big clash between Utd and Liverpool this weekend. One of the games of the season. Both teams have something to prove, as with most of the big clubs this season they havn't had the best start. Rooney will be buzzing after becoming England's top goal scorer. West Brom v Southampton games looks to be very close, should be a good match too. Round 5 and on-wards last season is where the results of the system really started to pick up, lets hope for a similar turn of events this year. Good Luck everyone. What are Chelsea and Liverpool up to? Some serious pressure on their management teams right now. Is it too late for them now to challenge for the title? Round 6 Tips are now placed. 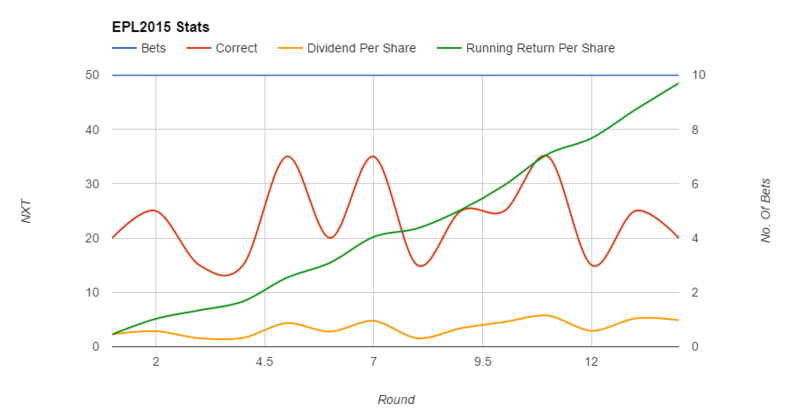 Looks like a tough round, but the returns also reflect that. The Red vs Blue derby in the capital should be the game of the round this week, although most games are expected to be very close so should be good watching. 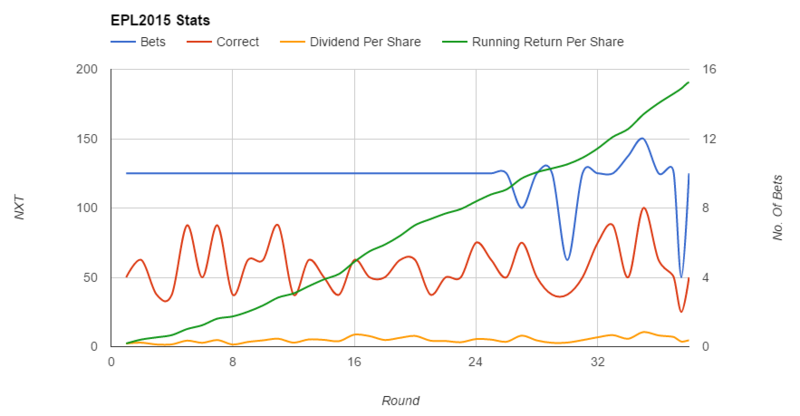 Round six is now complete and dividends paid. As expected a tight round. Again the big teams causing some unexpected results! The higher odds keep Divs at an OK level. Some strong predictions this week so i'm hopeful, however with the random results from some of the bigger clubs who knows! We are almost 50% sold of the asset too which is great as we have a healthy pot, and room to add more as the results and season go through. Interesting round coming up, the first draw predicted between Villa and Stoke. We have the Merseyside derby and a massive clash between Utd and the Arse. I hate it when the system tips against my team (Utd) especially in the big games like this. Victory will be bittersweet Some great odds again this week putting potential returns at around 1.5BTC! That combined with a slight drop in NXT price means a potential 6.8 NXT per token return this round. Round eight is now complete and dividends paid. What a horrible weekend of sport! West Coast Eagles lose the grand final, England lose to Australia in the World Cup of Rugby, Bronco's lose the Grand Final of the NRL and Manchester Utd get thrashed by Arsenal. To top it off we have a bunch of draws and chelsea lose for a bad round of tipping. Tips for Round 9 are below. I hope your national team, if they played, had some wins. Very excited to see England go through with 10 out of 10 wins, although a weak group, you can only beat what is in front of you. Roll on 2016 Euro's!!! This wee we have a nice possible return due to an increased kitty from sales, and also some favorable odds. Again having to tip against Utd is always hard, but the Everton game is always a tough one for us. Palace vs West Ham should be another good game. I saw an interesting stat the other day about Liverpool and that something like their last 6 managers have all lost their first game in charge. Will Klopp be the same? The system thinks so! Round nine is now complete and dividends paid. A mix bag this round. Klopp managed a draw, Man Utd and the other big teams won. Let down by the smaller teams this week. NXT price is low which bolstered the div's. Round 10 Tips are below. The odds again this week are quite favorable. Some of the bigger teams giving some nice results. Sunderland v Newcastle and Utd vs City are the two games for me this weekend. Chelski vs the Hammers should be good to watch too. After this week we'll be 1/4 of the way through the season and i'll give an update of where we are at in regards to ROI etc. Whats going on at Chelsea? How long does "the special one" have left? The Utd vs City game was a fizzer, althought as a Utd fan i'll take a point. Very tight at the top of the table after 1/4 of the season gone. Liverpool vs Liverpool 2nd ends in a draw, Klopp hasn't weaved his magic yet. With 1/4 of the season gone, our hit rate is 46%, and returned just shy of 30 NXT per share (from Round 1). On average 12000 NXT per round total dvidend. Just under 50% of tokens sold. Just a quick one to say that the EPL2015 tokens are now over 50% sold. Chelski vs Liverpool is the game of the round. Chelsea really need to turn their season around and Klopp is looking for his first league win. City already predicted to smash Norwich are coming of a big win in the cup last night. Utd having dropped out of the cup on pens need a win too. The pot has grown so we're looking at good potential returns again his week. Great round this week, Chelsea managed another loss giving Liverpool some much needed (and unexpected points). Not sure whats happening over at Man Utd, a draw with Palace is a terrible result. Tips for Round 12 below. Arsenal vs Spurs is always a good match, Spurs will feel they are in with a good chance to beat their neighbors after they had 5 put past them in Europe. Spurs play tonight and will be wanting a good result to go in to the weekend with. The Stoke vs Chelsea game is close than it really should be on paper. Chelsea's recent form is terrible and Stoke are currently 1 place and point above them in the league. Will "The Special One" survive another EPL week? On the plus side (for you's anyway), I wasn't awake when i pad div's this morning and used last weeks figures. I paid 5.7266021 NXT rather than the 2.915614 i was meant to. I'll just remove the extra from next week's Divs. Enjoy the early payment! bad rounds happens but you are just one prediction behind your 58 correct predictions of last year after round twelve. Thinking about buying a huge chunk , but i also have to relocate in a new appartment, oh god what a painfull decision i'm trying to make now. Just a reminder there are no tips for the EPL this week because of the international break. We'll be back next week. Tips for Round 13 below. City vs Liverpool this week is probably the top game, City should have it in the bag, but this season has seen the big sides in some strange upsets. Some great odds this week, so a good potential amount of winnings available. We have the Spurs vs Chelsea game which should be a cracker, Chelsea really need to find form!. The top of the table (!?!) clash between Leicester and Utd should also be a good game. Can Vardy continue his scoring run? A bunch of draws this week. Again the big clubs still struggling. How about Mr Vardy and his goal scoring run tho! Might be worth a punt on him scoring next week! The bookies have the Swansea vs Leicester game as being a close one, but on paper Leicester should be the easy winners. All eyes on Vardy to see if he can go 15 in 15. Not much else catches the eye this week. All the big clubs struggled again this week (including my Team Utd who dropped out the Champs Lge :`( ) Leicester racked up another win, but the goal machine Vardy didn't score this week. A few more weeks untill the half way point, with the busy Xmas period coming up. Can the bigger clubs make the most of the depth of their squads? Some great odds this week, so a very healthy possible dividend, a reflection on the state of the league i think. All of the big clubs have something to prove this week. All eyes will be on Leicester hosting Chelski. Can the new boys on the block beat the champs? Utd need to bounce back after their Europe exit and Liverlol are still looking for consistency under Kloop. 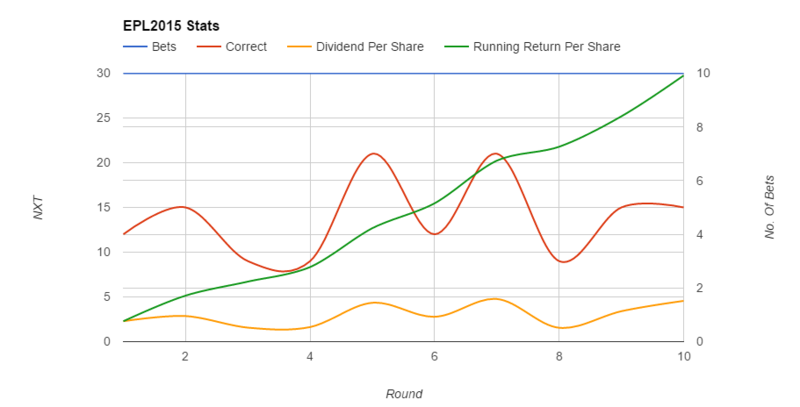 No dividends for Round 16? I'm in the process of moving home and have limited internet access. I'll attempt to make div's today, at latest it will be tomorrow, before i release the tips for round 17. Round 16 although only 5/10 correct, has produced a good div because of the odds. Hold tight! TIPSEPL was active today, but no dividends? Yeah sorry for the delay guys. My new place dosn't have interwebs, so i can't connect the laptop up. I have a project at work go live today and it's been hectic! I'll try and find 5 mins at work this morning to do the needful. Here are the results for round 16. I'm paying dividends now. Interesting betting system you have there, i just got into NXT lately and I plan to invest in many assets to diversify. This will be one. Some close games again this week. The bigger clubs have still a lot to prove, everyone is thinking they can pickup points now. Change of guard? With Chelsea sacking Mourinho all eyes will be on them to see if they slip any further under all the uncertainty. 2nd plays 3rd with City and Arsenal meeting in a top end clash and both looking about the same on paper. Leicester and Everton meet along with the top two scorers in the league. Who will outgun who? Here are the results for round 17. Such a busy time of the year, both on and off the field! Such a crazy set of results this year. Will the new year bring a little stability?!? We're half way through the season after this round. Who do you think will finish up top at the end of the year? Will Leicester hold on? Will the usual suspects find some form? How many managers will we see replaced in the new years? Couple of tasty games this weekend. Utd versus Chelski, both struggling for form and then new kids on the block Leicester versus City. I think you've got a cool asset here (if you're gambler of course). Did your investors break even already? Do you have some user-friendly statistics? Something like amount of NXT waged, amount of divs payed, total prediction rate. I guess this asset will be obsolete when championship is over. Do you intend to start another one after this one is over? So you don't need to be a rocket scientist to understand that the ROI of 140% is no problem, and if you count the compounded intrest if you reinvest you are well above this target. Cheers. I think it adds a bit of spice to the games even if you don't support them. I don't think you'd make a bag of coin of this, but there is profit there for sure. I'll post a bunch of stats after this round is done to show where we are at, but at round 18 of 38, we're 0.96% of halfway to ROI. The system should get better as the season tracks on, so i'd expect ROI probably after 3/4 of a season. 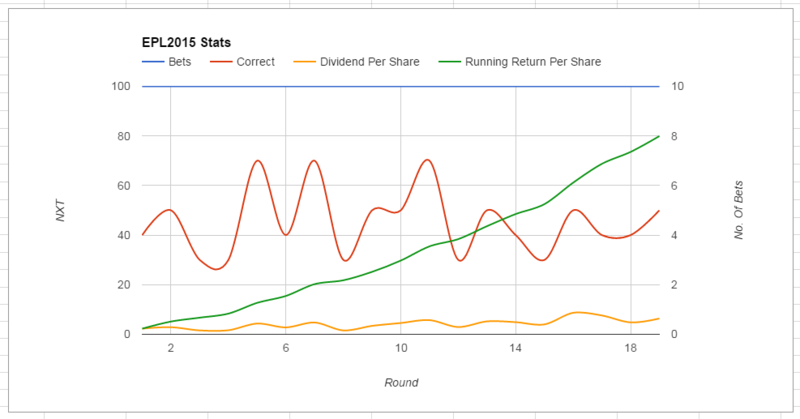 Last year ROI was achieved by Round 23. This season has been crazy, all the big clubs, including last seasons champions having terrible seasons. Great for the fans, not so great for punters Current successful prediction rate is about 43%, again i expect that to increase as the season goes on. I'll post a bunch of graphs towards the end of the week, with break downs of bets and divs etc. Yes at the end of the season the asset becomes voided, but I do give bonus shares to those who have held before in each new season. I think I was misunderstood here. I am positive for this asset. I am interested in more stats and more info in order to participate (with small amount, just for fun) in the new generation of EPL asset. I guess there is no reason to jump in the current asset since there is no chance to ROI jumping on the halfway to the finish. It makes sense but I will wait for a new season anyway. It's more fun to track the entire season and I want to check the performance of the current season. Wait,you will issue a new asset next year? So is this asset shareholder will get new asset share for free,or they need buy again? If they need buy again,why should anybody buy this asset at this point,there is only a small change they can get their NXT back by dividend. I gave 25% bonus to previous season asset holders this season. I agree the best value would have been to buy before the start of the season, so you get all 38 rounds. 2015 is done and dusted hopefully with all the craziness along with it. Lets get back to some proper results in the 2nd half of the season. Big guns need to start firing. Currently had you purchased a token at the start of the season for 150 NXT you will have had just 79.91 NXt returned to you in Dividends. The current avg div per token per round is 4.20, if this continues you will have made ROI by the end of the season and made about 9 NXT. System is starting to factor in the poor form of the bigger clubs this season and we can see with the Hammers predicted to beat Liverlol. Massive odds, which is nice for us We also have Chelski being beaten by Palace. Hopefully a bumper week! All, just a heads up i'm in the middle of a house move, so Div's won't get paid untill Fri/Sat this week. Will be done in time for the next round middle of next week. If i get some free time i'll get them done sooner. This asset could be something if it was managed properly. You've been around for a couple of months now, isn't it time to do some proper accounting and maybe set up a legal or financial fence for investor's security? If you're making money, it's worthwhile to do so isn't it? There have been at least a dozen attempts to do what the issuer is doing and they've all failed despite initial success. The onus is on the issuer to prove his asset will stand the test of time. You can tell it's poorly managed. If there's an upset there is no assurance provided that he will not simply cease operations. How do we know the business will survive even the smallest of downturns? Dear printshop, you criticize all the assets ! So you want to attract attention to your asset dead ? Prompt please , whether your asset is tied to the rate of NXT to the dollar or the euro ? How will dividends in the case of a rise or fall of the course ? No, which is why I didn't mention my asset in any of those posts. In any case unlike yours, my asset does not require outside investment. It's already a success. Betting is very interesting for investment , albeit very high risk. You have good statistics . Why do not you bet on the exchanges (Betfair)? By gambling on the stock exchange and asset pegged to the euro or the dollar, you could attract a lot of investment . All, thanks for your patience whilst I moved. I've now caught up with the Div's and will make a couple of posts for the 2 rounds results. I'll have the Tips for the next round out this evening. Here are the results for round 20. Here are the results for round 21. Last year i did a BTC -> AUD Asset which i then used regular bookmakers to place the bets. Odds were slightly better, but there was more effort in the AUD/BTC conversion. Ideally i would have a BTC asset which i could then bet direct with, but i havn't been able to find a platform which is trustworthy and can deliver dividends. NXT was the best option this year. I don't gamble on the stock exchange as I don't have a system built to predict results. I've built the system around the EPL, and have recently started trying it out on the Belgian Pro League. I may change the asset slightly next season to pick across multiple leagues if the data is encouraging this year. I'm also working on building a Tipping site which will generate some Affiliate marketing income. I just need the time to get it going. You can also see i'm trying to get an Arb asset off the ground, which i think has way more potential than this, as the returns are much greater. It just needs a level of investment to start (which i'm struggling to achieve) I'm hoping EPL2015 will build confidence in me and my ability so people will buy in to the other asset. The dangerous thing is that you presented your "asset" on the same terms as serious real business. "Investors" here have no protection. It does not matter if you are honest or not. The point is, this investment just isn't viable and no one should buy it. People will buy or they won't, but i did say in my first announcement post "It's more of a fun project than for making big dollars, something to add a little spice to watching the games each week" I appreciate your feedback anyway, robust discussion is good for the community. Chelsea looking to get their season back on track by beating local rivals Arsenal. The Sunderland vs Bournemouth game is very close and has great odds. Prompt, please, where you can bet in the BTC ? I have found both CloudBet and Nitrogen Sports to be really good. Offer a wide range of American and European sports, in game betting, and fast withdraw/deposits. If anyone else has any favorite places, let me know and i'll check them out too. The big teams stumble again. The run in this year will be fascinating for sure. Can anyone find form? Also, make sure if your using the NXT client, update to 1.7.4 or 1.7.5 else your on an old fork. Thank you. Registered on the second link , the first I have not worked . Here is the site - Betcoin ( BTC and LTC). Leicester meet Liverpool in what is likely to be game of the round, Leicester are expected to win and the odds like really good for it. All of the other big teams are slated to win, but this season has been anything but normal. It's a double header also this week with more games at the weekend. I'll have more tips up on Friday. Best round in a little while, again dissapointed by Chelski not being able to muster a result against Watford. Are the big teams going to find some form for the run in. How about that goal from Mr Vardy? Goal of the Season perhaps? Will Vardy move to a "Big" club next year, would he leave considering he'll play in Europe? Can Leicester win the league? Will be a good end to the season u think. awesome result!! thanks for the thrill and the div , really enjoying the whole package. Chelski United a draw to remember. Some good games again this week, Arsenal and Leicester at the top of the table will be something to watch, there is good money (about $4.60 at time of posting) on Leicester for the win surely that is worth a punt. No one can afford to drop any more points, so could be some cagey games out there. Ian, you are killing it with this asset. This should be the most popular asset on the NXT AE. We need to get this asset and your past asset's results some more publicity, so you have more funds to put in to the system. Thanks. We still have 12 rounds left so plenty of more fun and profit to be had! What a round! Things are really tight at the top now, this is going to be a really fun run in. A couple of more rounds to go and we are at the 3/4 point of the season. I'll publish some stats then to show where we are at. Short round this week because of the Cup Final. There will be a mini round when these games are played. , can Liverpool get some silverware? Is City too strong? Some good tipping! Hopefully start of a role as we wind down the season! Tips out shortly for the games later. Lets build on the last rounds results! Good Luck! Almost all the top teams had a stumble, crazy times. Can Leicester hold on the last 10 games? Will Tottenham? Can Arsenal, City or Utd finish with a flourish? One of the best endings to a league in a while for sure. Tips out shortly for the games later. I'll publish 3/4 season statistics after next round ends too. It's not looking good for Leicester! Can they get back to form? Will be a good London derby with Tottenham looking to go top again. Arsenal need a win to keep their title hopes alive! The Topsy-turvy season continues. With Spurs and Arsenal drawing and i think Leicester would have to really implode to lose this now. Currently had you purchased a token at the start of the season for 150 NXT you will have had 128.55 NXt returned to you in Dividends. The current avg div per token per round is 4.43, if this continues you will have made ROI by the end of the season and made about 18 NXT. Round 30 Tips are below. Another short round because of all the cup work going on. It might get a bit messy in the end of the season as we catch up with the postponed games. What a round in store! Chelsea vs West Ham, Newcastle vs Sunderland, Man City vs Utd. Some great games. Some big knock outs in europe overnight leaving some of the big clubs just concentrating on best league placing they can get. Despite Leicester beng out ahead, there are still doubts by many they will see it through! Round 31 results are below, divs will be paid on Monday as i don't have access to my work Laptop with my wallet on. Round 32 results are below, divs are be paid. It's got to be Leicesters to lose now right? Tottenham stumble really makes them hard to catch. How many weekends do we have left before the season and EPL2015 end? 6 rounds left, May 16th is the last games. Due to teams missing matches because of some other competitions, there are rounds with more than 10 games coming up. 67 Games left. Big game for Tottenham and Utd , Tottenham having dropped points last week need to win today. Utd wanting to secure Champs lge placing and keep any hope of their title chances alive need the win just as much. At the bottom Crystal Palace vs Norwich is the big game in the relegation battle. Getting to the pointy end now at both ends of the league. Round 33 results are below, divs are be paid. Also happy to announce that we have reached ROI for those who brought before Round 1. 151.2861722 NXT per token has been repaid in DIVS. It took longer than last year, but we still have 57 games left this season for pure profit. I don't understand,why just for a year,why not continue,you can create a great asset. It's an asset per season. The complete amount used through the sale of tokens is used for bets. The amount left at the end of the season will be 0. If i did another sale of tokens on the same asset, it wouldn't be fair to new subscribers as they would in effect pay nothing in to the kitty but would receive divs. I've run this over 3 seasons now on different platforms. NXT seems to have been the most stable and i'll likely continue with another asset next season, just with slightly tweaked settings. Extra game this week as some the postponed matches start to get played. We'll see a bit of this over the next few weeks. Some great odds this week, with a very healthy potential return. What a fantastic run in... Can Spurs catch the Foxes? Leicester have a tough run in and now will with out Vardy Party! New tips up shortly! 12 games over the next week, but odds are lower than last week. So much going on this week, Merseyside Derby, Leicester without Vardy, relegation battles!!! This is what the EPL is about! Could you please post the dividend details? Thanks mate! Can Leicester win it this weekend at old trafford. The system says it'll be a home win, but there is some really good money on Leicester which is hard to ignore. Tottenham looking for a win over their cross city rivals to keep their title chances alive. Leicester are Champs! What a season, what a #VardyParty Spurs have blown it at the last hurdle. Who wonders what the odds will be to retain the title? In other news we have now paid back over 1 million NXT in dividends with 2 rounds remaining. Hoping to finish the season on a high the next couple of weeks. Still some really tasty games left to play over the next couple of weeks. Some of the big teams still have a point to prove and reputations are at stake. The relegation battle continues also. The season comes down to the final week of games, both for the relegation and champions league battles. Can Utd pinch 4th?, some bookies paying 10/1 which is worth a punt in my opinion. Who will stay up? Will be some great viewing over the next week. I've decided to split the final week in 2. 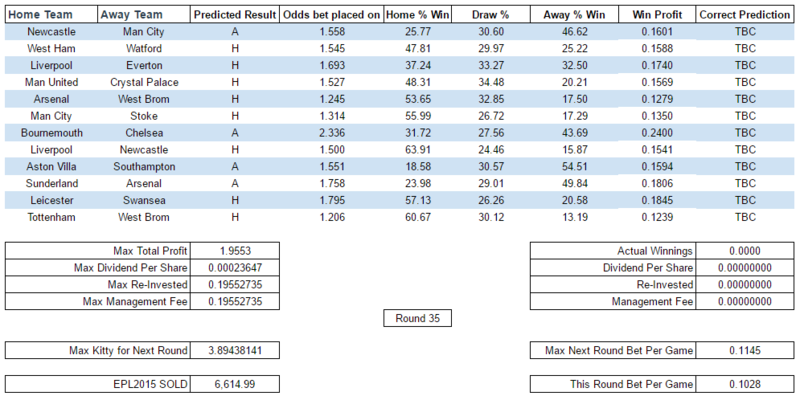 The first being the 4 catchup games midweek, then i'll publish the tips for the final games once these have all played. Hopefully allow us to make a little more profit as there will be 2 divs with chance for some reinvestment. Also allows a little better prediction for the final game as all games have then been played. The relegation battle is now all over. At the top though the final champs lge place is still up for grabs, along with the Europa lge places. It all comes down to the final games this weekend. This is it, the last round of the year, some teams have nothing to play for, others, it's everything. Can Some of the bigger clubs get their European place for next year? Good Luck in this Final Round! Due to the Bomb Scare at old trafford, the final round (38) is delayed slightly as they reschedule. And the race is run! What a fantastic season, right down to the last game. What were Tottenham thinking? They blew it! Add the drama with the Utd game being called off... someone will be out of a job thats for sure! 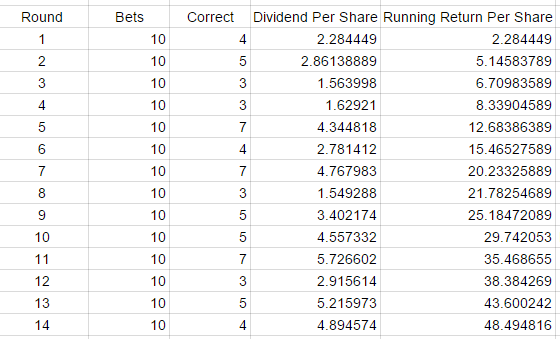 I'll post again once the final dividend of the Kitty split is paid, and again with some stats. Thanks everyone for the support this year. I hope you all enjoyed the season as much as I did, hopefully we have a bit more stability next year and not a 5000/1 team winning! I will be back next season, but with a couple of changes. Mainly to make the asset more attractive through the season by offering a reduction in price of the asset so that ROI is evened out for those buying in through the season. The other change will be to the types of bets being placed. My new system (which i'll launch along with the asset) provides Tips across a range of game day markets on soccer, and i'll be using those to drive what tips be bet on. We achieved a 46.58% hit rate this year, which was down on the over 50% last year. I think it's still great considering how volatile the league has been. I'll ping this post again once the new asset is ready for the next season. Thanks! Waiting for the next season. I didn't notice this asset in around one,will buy the next season at begining. The asset is done, i don't believe there is a way to remove the asset though? As per previous convo's in the thread, a new asset will be created for next season. EPL2015 was always intended to run only for the 2015/16 season. All funds have been used and the final amount left was split 80/20 to holders and myself. I will create a new asset sometime in July this year, i'm considering a similar plan as this season offering a bonus amount to EPL2015 holders on top of any new asset purchased. No bid for assets of epl2015 ? Sorry I had not read anything but as holder in action buy EPL2015 in November 2015 with the end of this ASSETS I appercoie me I lost some NXT ..
Hi Esther, below is a quote form the first page of this thread. I do intend to address this next season, with a decreasing cost of token per round.